When: Tuesday, February 19, 2019 (new date) and March 5, 2019 at 6:00-8:00p.m. Please call the Belleville Public Library at 424-1812 to reserve your spot. Would you know what to do if a child is choking or isn't moving or breathing? 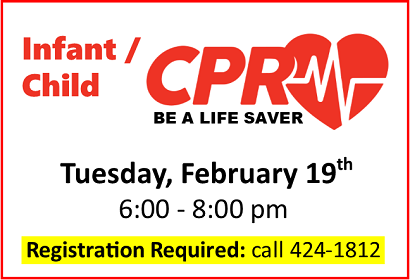 Learn CPR techniques specific to infants and children so you are ready in a life-threatening emergency. Instructor Gary Salmela will demonstrate and provide plenty of time for you to practice using a child-size mannequin. This class is free, but space is very limited. Call the Library at 424-1812 to reserve your spot.